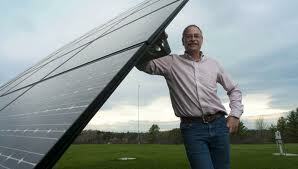 David Blittersdorf of AllEarth Solar has been working to advance renewable energy in Vermont for years, and was instrumental in getting the state’s standard offer program (a feed-in tariff) passed in 2009. He’s adamant that the state should accelerate its standard offer in order to meet its ambitious 2050 goal of getting 90% of its energy from renewable sources. But some of the state’s utilities have balked and others don’t seem to grasp the pace that’s needed to reach the state’s targets. A huge thanks and farewell to ILSR intern Wade Underwood, without whom this podcast would never have happened. In 2008, many of the state’s advocates were asking “what can we do to move renewables,” but the policy framework was lacking. One of the utilities hosted a stakeholder discussion about “green zones,” but Dave’s response was that “we really need to do something that will actually work.” Inspired by a presentation from Paul Gipe on feed-in tariffs, Dave helped shift the stakeholder meeting to a discussion of a standard offer program for renewable energy. Two hours later, they got to agreement. Within months, they were at the legislature, with support from the state’s largest utility. The long-term, standardized contracts and state-based permitting have dramatically simplified the installation of new renewable energy projects, but it’s solar power (and not wind, hydro, or farm methane) that has fulfilled its portion of the initial 50 megawatt program. There were applications for 10 times the 12.5 megawatt capacity offered, because the standard offer contract of 30¢ per kilowatt-hour (at the height of solar’s worldwide price squeeze) was sweetened by state and federal tax credits. Almost all the solar capacity is operational, but less than 8 megawatts of the remaining capacity in the program have started producing electricity. Despite the success of the solar standard offer and support from utilities, the state has retrenched, with a commitment to just 7 megawatts per year in addition to the original program. That leaves the capacity under the program at a small fraction (0.5%) of total state electricity sales. The success of the solar standard offer makes it a model for other states, suggests Dave, especially for distributed projects in the hundreds of kilowatts to a few megawatts. The state also allows virtual net metering, facilitating community shared solar projects, and a “value of solar” price adder on their net metering policy. Vermont may have more foresight than other states it its ambitious 90% renewable energy target by 2050, but it’s really the sign of a paradigm shift in energy, says Dave. We’re likely to electrify transportation and heating given the relative ease of greening electricity supply and if we’re going to de-carbonize, we can’t be burning coal. This is the 10th edition of Local Energy Rules, a new ILSR podcast that is published twice monthly, on 1st and 3rd Thursday. In this podcast series, ILSR Senior Researcher John Farrell talks with people putting together great community renewable energy projects and examining how energy policies help or hurt the development of clean, local power. Click to subscribe to the podcast: iTunes or RSS/XMLSign up for new podcast notifications and weekly email updates from the energy program!